Archaeological evidence from an Egyptian excavation 200 miles east of the Libyan border has helped bust the fearsome reputation of one of the country’s most famous pharaohs. Following an excavation directed by the University of Liverpool's Dr Steven Snape, the University of Manchester's Dr Nicky Nielsen says Egyptians who lived in the late Bronze Age fortress at of Zawiyet Umm el-Rakham were at peace with their Libyan neighbours. Dr Nielsen’s findings - published in the journal Antiquity – contradict the commonly held view that Ramses the Great was waging - and winning- fierce war with his neighbours, in Libya, Nubia and the Near East. The evidence- which included 3,300-year-old sickle blades, handstones, querns and cow bones - showed the Egyptians harvested crops and raised cattle herds up to 8km away from the protection of the fort, located deep in Libyan territory. According to Dr Nielsen, the finding adds to the body of evidence that Ramses had limited pedigree as a soldier. 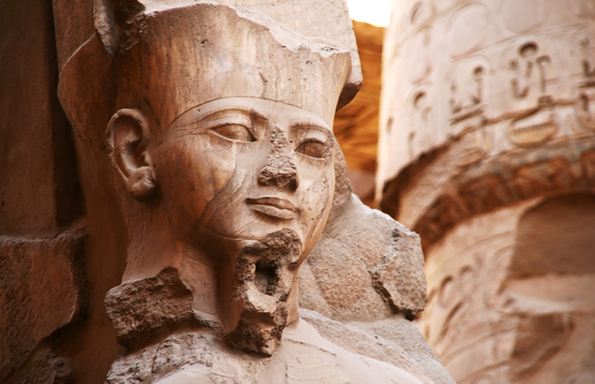 Ramses’ famous monuments heralding his prowess as a warrior were nothing more than ancient propaganda, says Dr Nielsen. “This evidence demonstrates the degree to which the Egyptian occupants of Zawiyet Umm el-Rakham relied on local Libyans not just for trade, but also for their knowledge of the local environment and effective farming methods,” he said. “It is another strong indication that the widely held belief that Ramses was one of history’s greatest generals – is completely wrong. “How on earth could Ramses have been fiercely at war with Libyan nomads- when his soldiers were living in peace with them deep in their territory? It just doesn’t add up. According to Dr Nielsen, the Hittites - the Egyptians’ foes- tricked the young king into fighting them, which led him to impetuously imperil a division of his army. It was only when the three other divisions of his army eventually rescued him was he able to escape, but with no territory gained. In fact he lost control of a great part of modern-day Syria after the battle. He added: “When you realise that Ramses re-inscribed monuments dedicated to others – so that it appeared they were celebrating his achievements, you realise what a peddler of fake news he was. “His name was often carved so deeply, it was impossible to remove it – thus preserving his legacy.